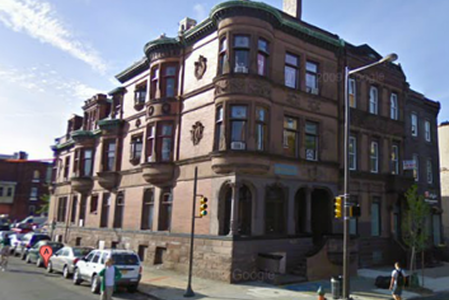 Temple's Alphia Epsilon Pi fraternity house at Broad and Norris streets. A driver was hospitalized Saturday night after his car slammed into a fraternity house at Temple University's main campus in North Philadelphia, officials said. According to police, the vehicle was headed down North Broad Street near Norris Street when it lost a wheel and veered into the fraternity house of Alpha Epsilon Pi, the university's Jewish Greek organization, NBC10 reports. It wasn't immediately clear what caused the car's wheel to come free from its axle. The driver was taken to Temple University Hospital and his or her condition remains unknown as of Sunday morning. The fraternity house sustained damage to its front steps and porch, leaving concrete and stone rubble at the entrance to the residence. Authorities suspect that the vehicle may have been involved in a hit-and-run accident at another location prior to crashing into the frat house. Police have yet to announce charges and an investigation is ongoing.